A warm welcome is extended to all new society members. We have much to enjoy, compare and share throughout the state. Beyond Tasmania many friendships and contacts are made between society members and regions throughout Australia. The Northern Group has a large membership of vibrant people covering all ages, from young people wishing to learn about our native flora to people with a wealth of experience who have had a lifetime interest in native flora who are only happy to discuss and pass on their knowledge. Amongst our members are well known horticulturists Sally and Herbert Staubman who have developed a magnificent native plant nursery beneath Dry’s Bluff at Liffey – a visit to Habitat Plants is a wonderful experience. Another member and amateur botanist Roy Skabo received huge publicity in 2008 when he discovered Hibbertia rufus, not seen for 120 years in bush behind Binalong Bay. Another two of our founding members, national treasures and respected as two of the foremost experts on the Acacia family in Australia are John (deceased) and Marion Simmons. Such is their recognition that they have had an Acacia named after them Acacia simmonsiana. Any prospective member has the opportunity to talk to experts such as those mentioned plus many more. We also have some excellent guest speakers who over the years have delivered some outstanding talks that have benefited members greatly. For new members subscriptions remain valid for twelve months from date of payment. Download membership application form and Download member brochure. An introductory plant voucher is provided for each new member and plants can be claimed from the group nursery. Four issues of the national journal Australian Plants published by APS (New South Wales Ltd) where paid for in subscription. 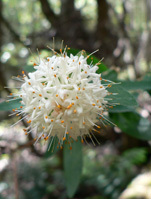 Four issues of the Tasmanian newsletter Eucryphia. PDF Download [ Access to the Northern Group’s extensive library]. Access to society publications and plant related books at discount prices. Access to members’ Australian native gardens for inspection and enjoyment. Propagation sessions for exchange of methods and ideas.